FREDERIKSTED — A series of planned network changes at JetBlue will see it shift fleet resources from what it considers underperforming cities and accelerate its focus-city growth strategy in Boston and Fort Lauderdale, the New York-based carrier said today. 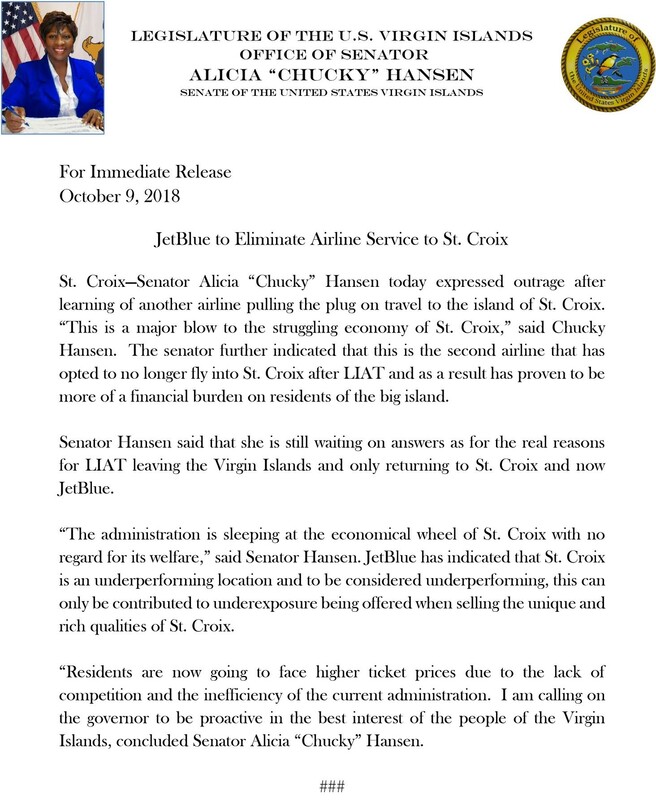 JetBlue determined that St. Croix’s Henry Rohlsen Airport was one of those “underperforming” destinations and will be eliminated in January 2019, the Virgin Islands Free Press has learned. The service reallocation will also result in a new JetBlue destination in Ecuador, new service between current JetBlue cities and more flights on popular routes. Plans call for the new daily Airbus A320 service from Fort Lauderdale to Guayaquil, Ecuador’s José Joaquín de Olmedo International Airport to start during next year’s first quarter. Guayaquil becomes JetBlue’s second destination in Ecuador—it began serving Quito in 2016—and its sixth in South America overall. The new flights between Fort Lauderdale and Guayaquil expand JetBlue’s footprint outside the U.S., and marks part of a broader effort to reach into international markets. It now operates in 22 countries in Latin America, including a dozen island destinations in the Caribbean and various cities in Mexico, Colombia, Costa Rica, and Peru. Plans for this winter call for JetBlue to introduce routes between Boston and Rochester, New York; Fort Lauderdale and Phoenix; Fort Lauderdale and Saint Maarten; and Providence, Rhode Island, and Palm Beach, Florida. Meanwhile, the airline also plans to increase flights on nearly two dozen of its most profitable existing nonstop routes in the Northeast, Florida, and the Caribbean. Roughly two-thirds of the added flights will originate in Boston or Fort Lauderdale, it said. In Fort Lauderdale, the airline has committed to up to 140 daily departures and recently expanded its operation to new gates in Terminal 3 and began using Terminal 1 for additional international arrivals to help support future growth. Cities slated to lose service starting January 8 include Daytona Beach International Airport from New York JFK Airport and once daily service from San Juan to Saint Croix. JetBlue also plans to eliminate daily service to Washington Dulles Airport from New York JFK and Boston. Elsewhere on its route map, the airline plans to cut flying on a number of other underperforming routes and frequencies in January, including certain flights serving Baltimore, Detroit, Pittsburgh, and Santiago, in the Dominican Republic. In Mexico City, where JetBlue is launching new service from Boston and New York JFK, the airline will reduce twice daily service from both Fort Lauderdale and Orlando International Airport to once daily in the first quarter of 2019. Finally, at Portland International Jetport in Maine, JetBlue plans to cut its year-round daily service on January 7 and transition to daily summer seasonal service next spring.